Attention heavy metal fans of the world. Saxon’s latest album, THUNDERBOLT is on mark to be one of the top heavy metal albums of 2018. ​This album is a must listen! 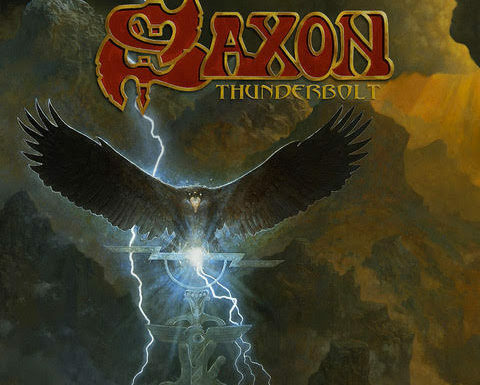 Northeast Rock Review had the chance to listen to SAXON’s latest album THUNDERBOLT. What a delight. It is always great when you put on a new album and it instantly sticks. There is no waiting for it to get good, its just good, all the way through. Thunderbolt hits you right in the face with classic sounding metal. The album is a rarity in today’s world of new metal music. You will have to flip the record or cassette over, because that’s how cool this album is! Available on several formats, including a multi CD Album in Digi-pack, 180 gms colored vinyl in a Gatefold, A Special Edition Box-set, Tape Cassette and Digital Download. The albums starts out like any traditional metal album of the 80’s should start off. Not that that there is anything wrong with that. In fact it is is great to pop in music and hear that original hard rock sound that rock fans can appreciate. It is new, it’s fresh and it picks up where Saxon last left off for a continuation of pure British metal. An introductory, instrumental, “Olympus Rising” is a prelude of what is to come in the album. “Thunderbolt” is a hit. It has a musical vibe like it was 1980 something and everything was all good… listening to a fresh rock album for the first time. This whole album should be appreciate for everything that it presents, the classic sound. Musically, the drums and guitar really top the mark with melodic guitar riffs throughout and stellar drums. Biff Byford’s voice is stellar. The albums works like a well oiled machine. It is heavy metal meets prog rock. All the way through. It is a classic old school British rock sound that has grown metal fans over the decades. SAXON will tour North America with fellow British metal legends Judas Priest and supporting artist Black Star Riders. The North American tour will begin in Wilkes Barre, PA on March 13 and visit several major cities all over the map – including Washington DC, Detroit, San Francisco, Los Angeles, Dallas – coming to an end in San Antonio, TX on May 1. The album was much more than expected. Do yourself a favor and pick this album up. Watch the band’s YouTube video previews, and pre-order it now. It far exceeded all expectations of new metal. THUNDERBOLT is available in several formats, including vinyl and cassette. Now that is something to be excited about. Saxon comes full circle with this album, bringing back the formats that rocked our worlds back in the day, along with the original, hard hitting and melodic sound. Saxon isn’t wasting any time in 2018. Following the critically acclaimed release of ‘Battering Ram’ in 2015, the heavy metal giants are set to release their latest studio album, ‘Thunderbolt,’ on February 2nd via the Militia Guard label (Silver Lining Music). ‘Thunderbolt’ will feature original Artwork by long time Saxon collaborator Paul Raymond Gregory. Three weeks later, the band will be embarking on the first leg of the Thunderbolt 2018 European Tour followed by a North American tour as special guests to Judas Priest. Since the 1970s Saxon has shown their ability to take rock ‘n’ roll and give it an electrifying edge which has since cemented their status as pioneers of the British heavy metal wave. With over twenty studio albums under their belt, Saxon has made their steadfast dedication to creating a dynamic body of a work a staple of their career.